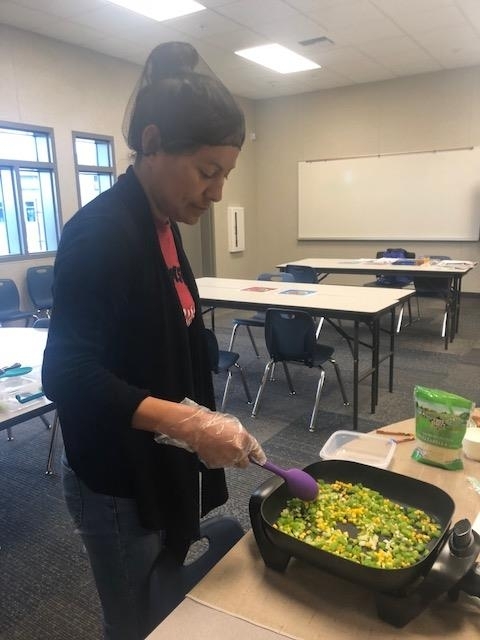 UC CalFresh launched the new and improved Eating Smart, Being Active nutrition classes in Madera county. The first stop was Virginia Lee Rose Elementary! To reach parents, UC CalFresh partnered with the Parent Resource Center. 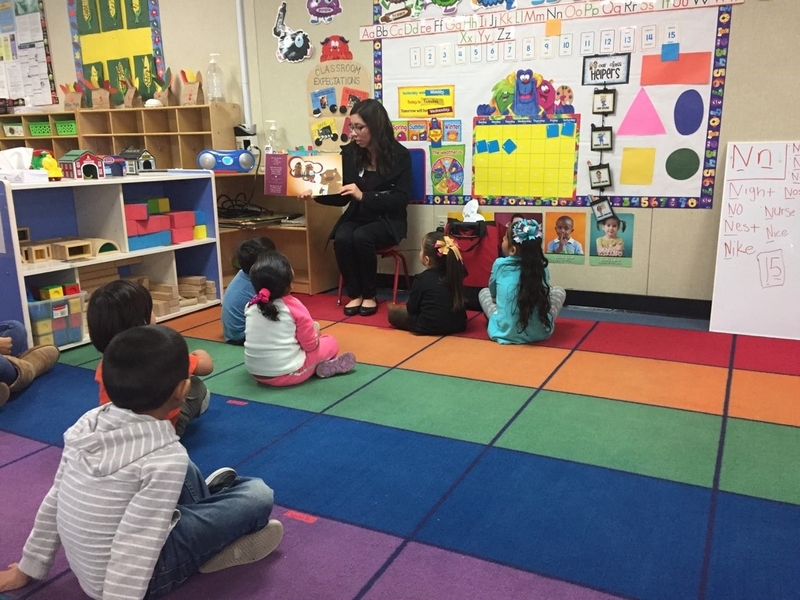 Parent Resource Centers are found at seven elementary schools within Madera Unified School District. Their goal is to provide resources that will help parents with their children's education while also encouraging parents to become involved in their children's school. 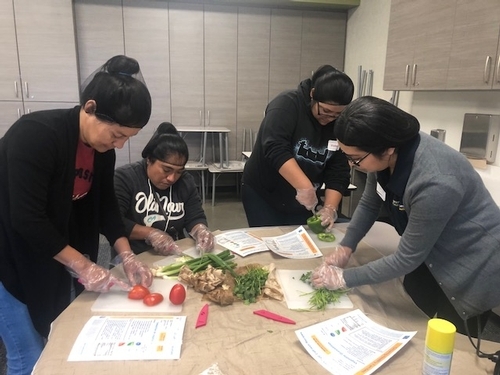 With the help of Parent Resource Center staff, UC CalFresh was able to host a nutrition series for Virginia Lee Rose parents from March to April. 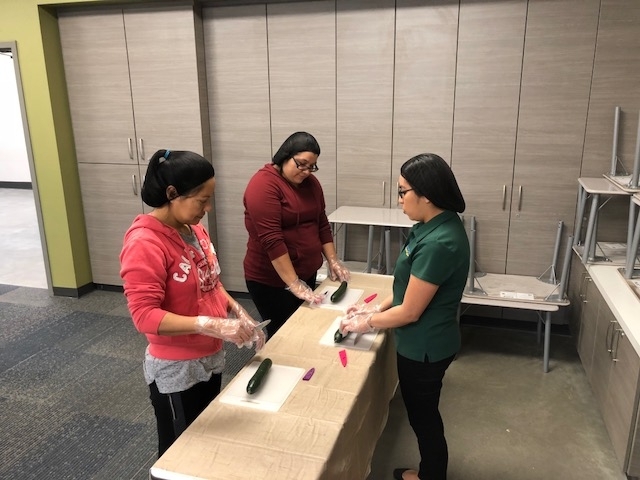 Parents who participated, learned proper knife skills, how to make meals healthy and be physically active, and so much more! UC CalFresh Nutrition Program Coordinator, Elizabeth Lopez, teaching parents how to properly use a knife. While some had experience following a recipe, for others, this was their first time following a recipe and measuring out ingredients. 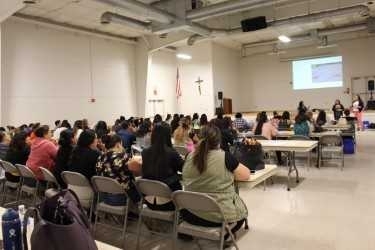 The five parents who participated in the class series expressed that they enjoyed the experience and the information learned. After learning how to correctly use a knife, parents put their skills to the test. Together they prepared a vegetable quesadilla! Cooking the vegetables for the quesadilla. Yum! Parent excited to receive her certificate for attending the nutrition classes. 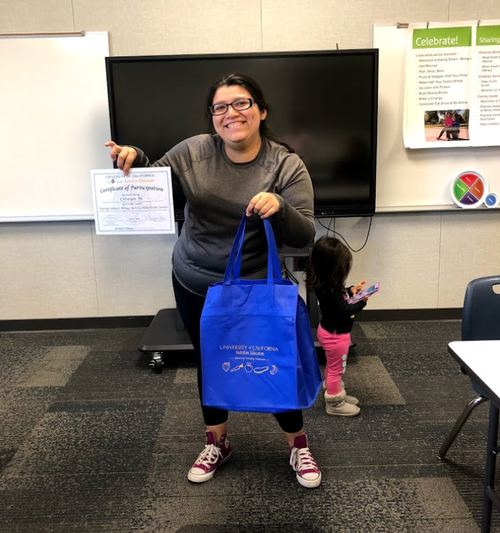 Thank you Parent Resource Center and Virginia Lee Rose Elementary for allowing UC CalFresh to build and maintain healthy families and communities! Sugary beverages are a sneaky source of excess sugar and calories. According to the CDC (2017), every day 63% of children and 49% of adults drink a sugar-sweetened beverage. Increasing awareness of how to identify and visualize amounts of sugar on a nutrition label can help people make healthier beverage choices. 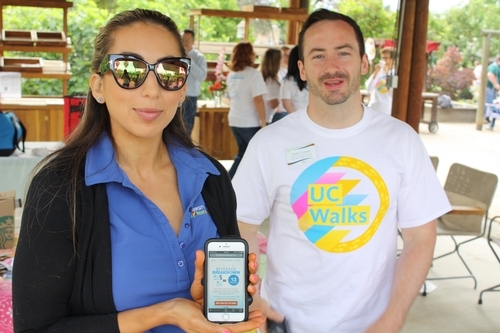 On May 16th, UC CalFresh took part in the Champions for Change: Rethink Your Drink Day campaign. 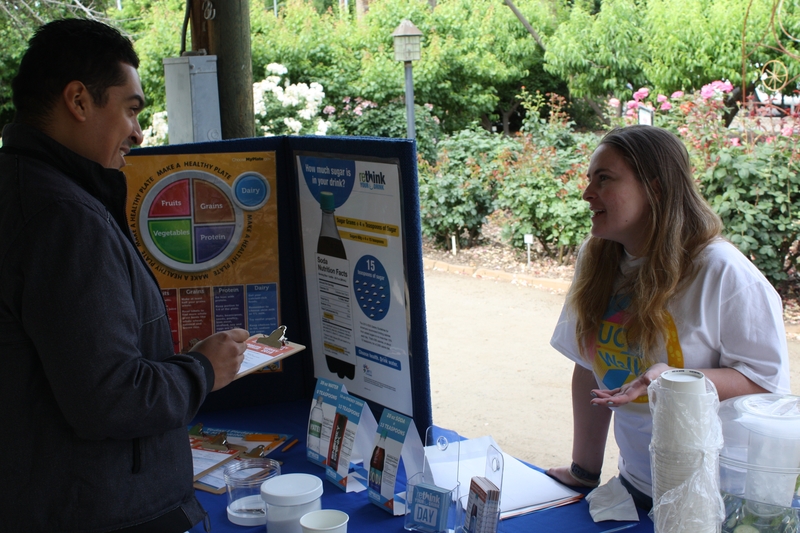 Nutrition educators Ashley Abrahamson and Nora Lopez set up an informational activity booth at UC Walks Day at the Garden of the Sun in Fresno. 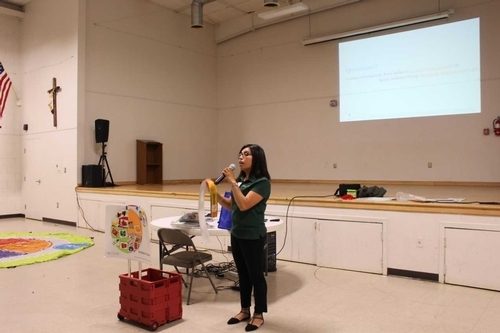 Their display included nutrition facts of common sugary beverages and bowls to measure the amount of sugar so that participants can truly see what the sugar content in their favorite drinks looks like. Participants were also encouraged to use the Beverage Breakdown website to see how much sugar they end up drinking throughout the entire day. To finish the event, participants were provided a sample of refreshing cucumber and mint water. The Statewide Day of Action was conducted at over 308 sites, sharing valuable information that will encourage healthier choices across the state! Are you ready to rethink your drink? Try the beverage breakdown here! 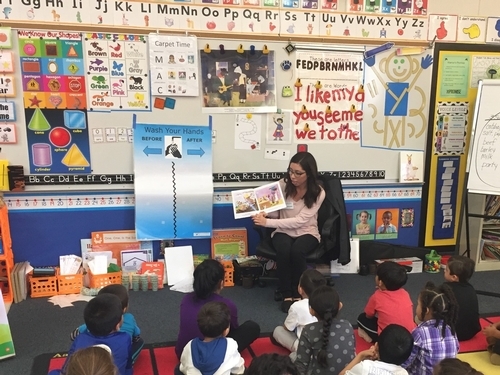 UC CalFresh Nutrition Education Program has continued its partnership with Madera's Community Action Partnership of Madera County Head Start by providing nutrition lessons. 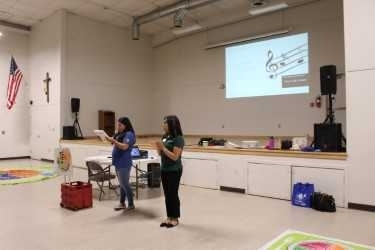 On May 7th the Madera UC CalFresh Team had the opportunity to present to Madera's Head Start teachers on how to utilize our Happy Healthy Me… Moving, Munching & Reading Around My Plate curriculum. This curriculum's goal is to have 4-6 years old children develop healthy eating and physically activity habits that will last a lifetime. 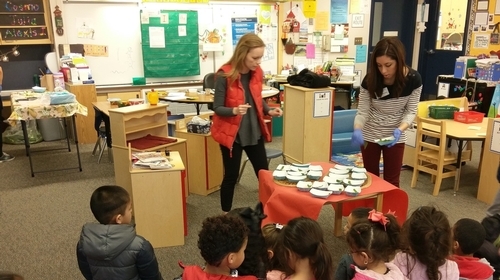 At the training the staff demonstrated the many aspects that the curriculum has to offer such as physical activity games, nutrition activities, and arts and crafts that correlate with the specific lesson. After completing the training more than 50 teachers have been trained and enrolled on the curriculum. More than sixty children will benefit from this training through their teachers new skills in the curriculum. Mrs. Roxie Schallberg quickly acknowledged that implementing the Lowe's garden grant required more than just a vision. After Madison Elementary received the grant money, there were steps to take with the district, school and maintenance staff to make this vision come to life. 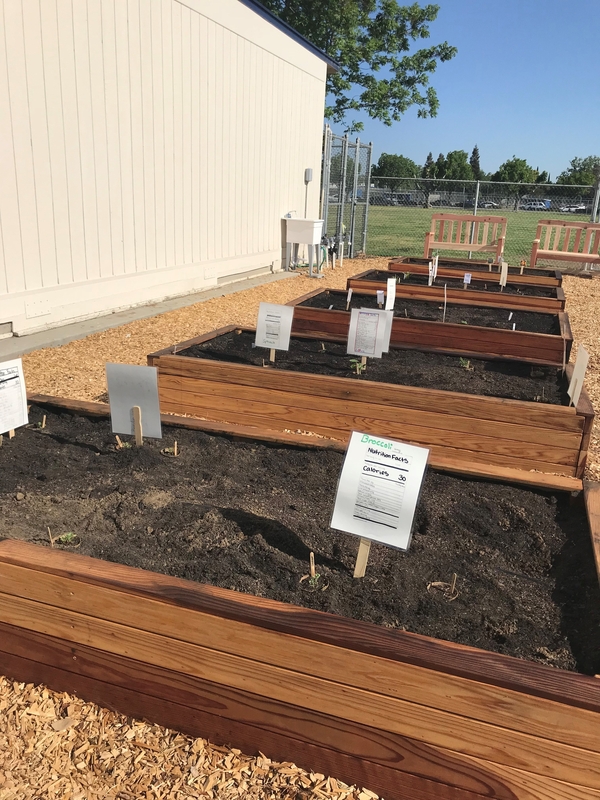 To begin the garden project, Angelica Perez, UC CalFresh coordinator, supported Mrs. Roxie Schallberger in applying for the grant. Once the grant was awarded she was able to guide her in scheduling a meeting to help her in the initial steps to begin the grant implementation. In the meeting was Madison Principal Mercedes Ochoa, and Curtis Manganaan, Director of Maintenance and Operations for the district. They both played a key role in helping to identify barriers and solutions and how to bring together a new garden at the school site. As the meeting ended, all the information and next steps where identified and the garden vision was soon becoming a reality. The garden beds were recommended to be built by Ripperdan Community Day School in Madera, CA. 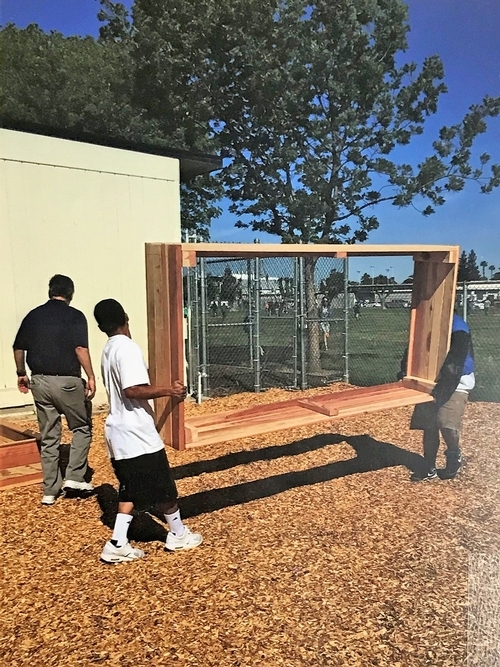 Students in Mr. Scanlan's wood shop class were tasked with building the wooden garden beds and benches for Madison. Maintenance staff are also much appreciated for the design of the garden location, leveling the ground, fencing off the area and in making the garden area nice and easy to use. 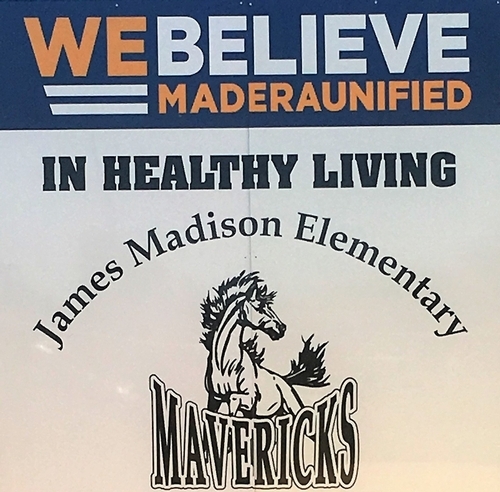 Finally, the “We Believe in Healthy Living" Madison Mavericks garden sign came in after the beds and benches were in place. The garden is now ready to be fully used. Although the original plan for the Madison garden took a turn in the beginning planning changes, the new location and design was even better than the original plan. 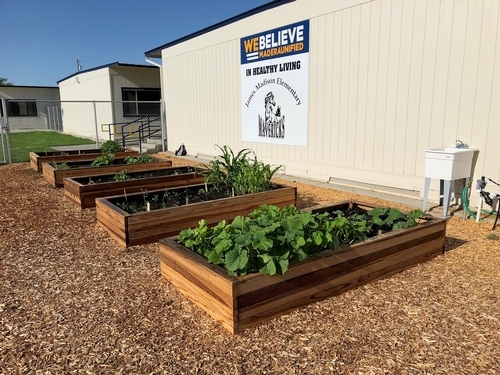 The We Believe in Healthy Living Garden at Madison Elementary was a big team effort that created impactful connections with Mrs. Schallberger, Madison Staff, UC CalFresh Nutrition Education Program, Lowe's, Ripperdan Community Day School and the school district and maintenance staff. 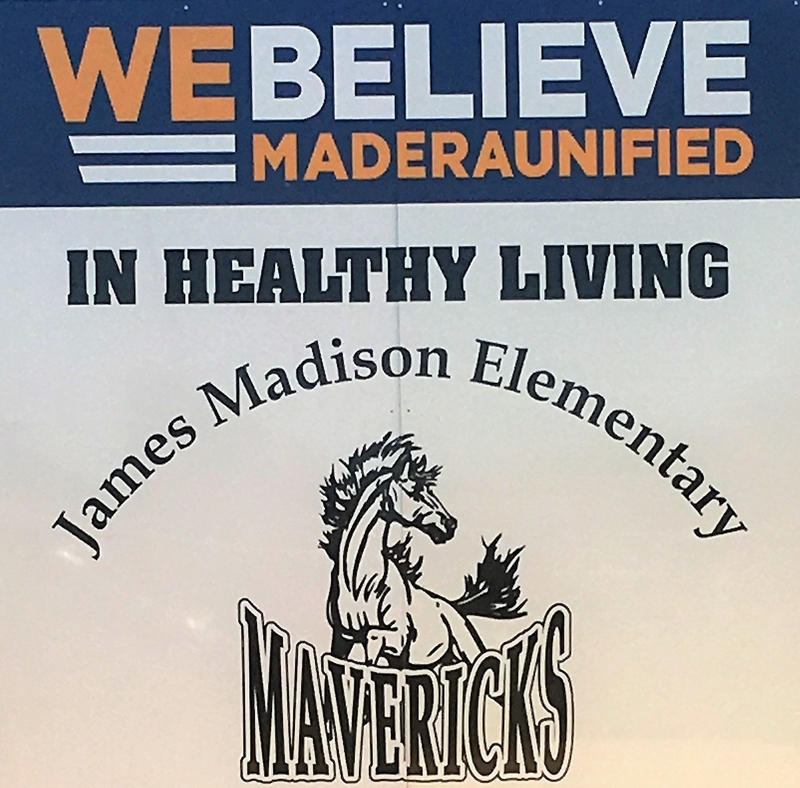 All of these collaborations and contributions make the Madison Mavericks We Believe in Healthy Living garden project even more special. 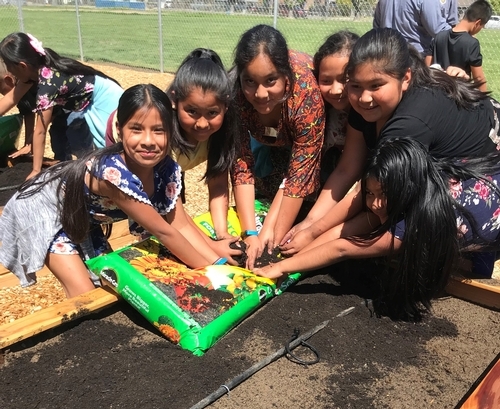 The school looks forward to its official garden opening day next year and will plan to have lessons in the garden for all grade levels that wish to participate. Below are some pictures detailng the progress of the garden. 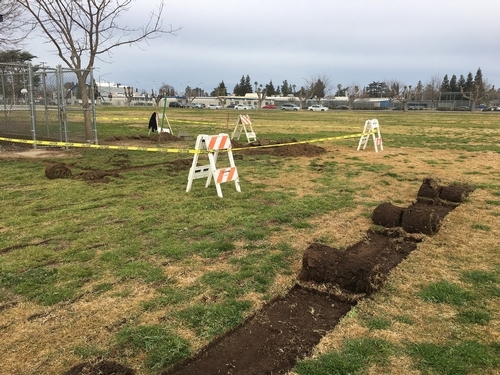 Garden location identified, ground leveling beginning.February 26, 2018. 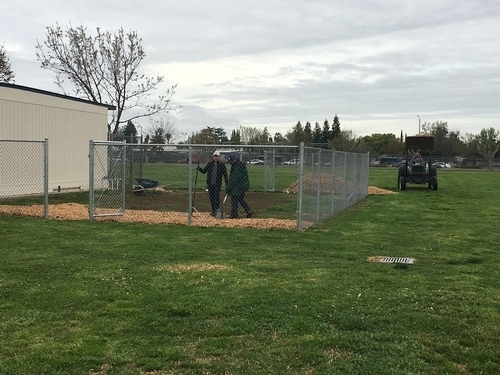 Garden location fenced off and mulch being added by maintenance staff. April 6, 2018. Ripperdan Students delivering the garden beds to Madison! April 23, 2018. 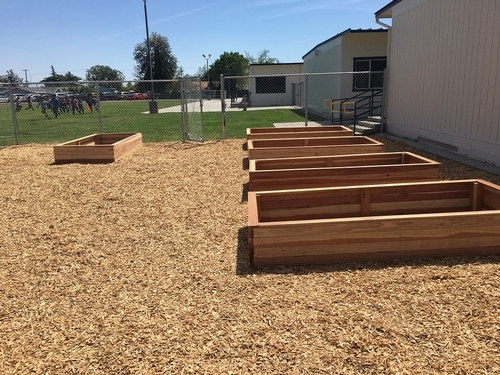 Garden beds built Ripperdan Community Day School delivered on April 23, 2018. 4th graders at Madison Elementary calculated how much soil the garden beds would need, and were able to add the finishing soil to the garden beds. April 25, 2018. 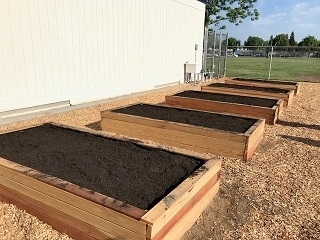 Garden beds filled with soil. April 26, 2018. Already there have been visitors in the garden to transplant their seedlings and to do a garden nutrition activity investigation. So its future use looks bright! Students transplanted their seedlings and added their nutrition labels in their new garden space! May 3, 2018. 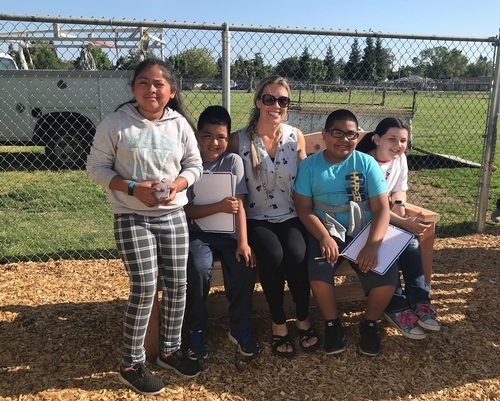 Mrs. RoxieSchallberger and her 4th grade students trying out their new garden bench! delivered May 3, 2018. 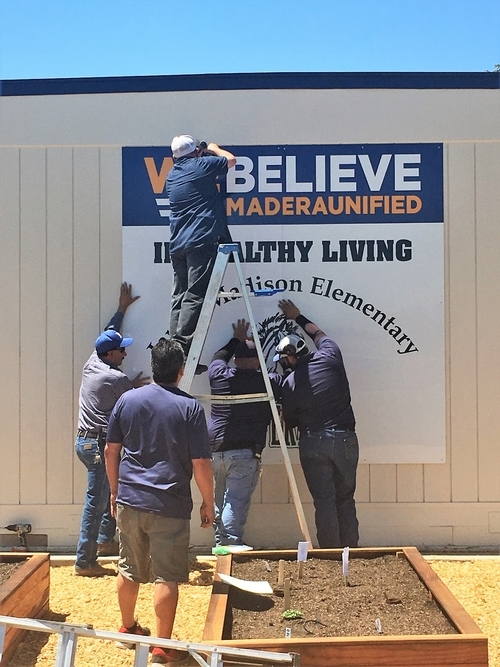 Amazing maintenance staff putting the "WE BELIEVE in healthy living" sign up. May 7, 2018. The last image shows a garden picture with over a month of seeds and seedling growth. May 31, 2018. 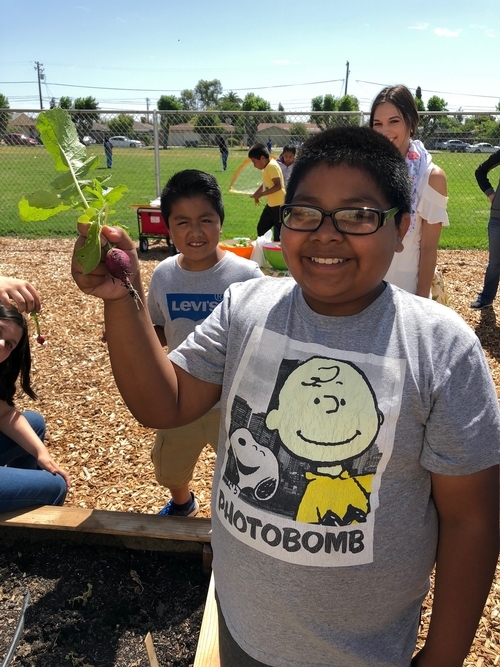 4th grade Student, holding the first of many garden harvest! A radish! May 31, 2018.